After recently being proclaimed a must-see by New York Times, Rough Guide and CNN, Rotterdam is officially on the map as an eminent travel destination. With its cutting-edge modern architecture, marvelous museums, top notch cuisine and original boutiques, the growing popularity of Holland’s second biggest city is well deserved. Still, it takes an insider to discover the real gems of “Roffa,” as locals like to call their hometown. “It’s quite a challenge capturing this city,” photographer and Amsterdam native Daniel remarks after walking around the center for an hour. “There are plenty of beautiful things to see, but there’s always something ugly blocking the view.” As far as I’m concerned, it’s exactly this ambiguity that makes Rotterdam so interesting. “Rotterdam is not an illusion, deluded by camera. It doesn’t have cinematic appeal, Rotterdam is far too real,” is a spot-on quote by one of the city’s most famous contemporary poets, Jules Deelder. Rotterdam, the city that lost 90 percent of its center’s original architecture in World War II, just doesn’t have that instant appeal its forever nemesis Amsterdam does. If Amsterdam is the beautiful woman you immediately fall in love with, Rotterdam is the tough, street smart girl you have to impress with your own quick-wit. If you really get to know her, she’ll be in your heart forever. Strolling through the city, we check out the coolest new places in town and meet a few local legends. Sevdaliza’s favorite places in the city all involve – not surprisingly – music. “I really like the Witte de Withstraat, because it has some great bars and is such a melting pot of different cultures. Food-wise my favorite place is Picknick, they serve a great lunch and the service is super friendly. When it comes to Rotterdam’s nightlife, it’s also a matter of knowing where to go. Back in the nineties, the city was known for its crazy parties, with the extravagant Now & Wow fests at the Maassilo as an absolute highlight. Later, the club scene went underground or disappeared altogether. With the recent opening of no frills clubs like Perron and Toffler, a new type of grimy house scene that resembles the one in Berlin is on the rise. One place that’s definitely worth a visit is the hidden cocktail bar called “The Doctor.” The address is top secret and you can only get in by making an appointment by phone. Once you’re lucky enough to get the number, a voice asks you what you need an appointment for. After all, you’re going to see the doctor. Pain in your throat is always a good answer, because The Doctor serves the best cocktails in town and possibly the country. Best chance of getting in is by paying a visit to Barrelproof, also located in the Hoogstraat. This great little liquor store has the same owner and if you play your cards right, they hook you up with the doctor’s number. Also be sure to ask for a shot of one of the many local gins and exotic mescals for sale. You have to ask explicitly, because a liquor store is not allowed to offer it themselves. But if you ask nicely, they might mix you up an incredible gin and tonic on the spot. When the day is done and the party is over, the best place to stay is nhow, designed by world famous architect Rem Koolhaas. With partner-hotels focused on fashion in Milan and music in Berlin, in Rotterdam it’s all about art and architecture. The entire hotel is build on the basic principles of light, glass and air and every floor features work from established and upcoming artists. Since it’s located on the “Kop van Zuid,” also referred to as “Manhattan on the Maas,” the views on the city are spectacular. Naturally, the higher up you are, the better. We recommend staying on the sunrise-side of the building and enjoying the sunset at the hotel bar on the rooftop terrace. While watching the sun disappear behind the city’s skyline as giant cargo ships are passing by, we have to disagree with the poet Deelder. Rotterdam does have cinematic appeal and there’s no such thing as being too real. 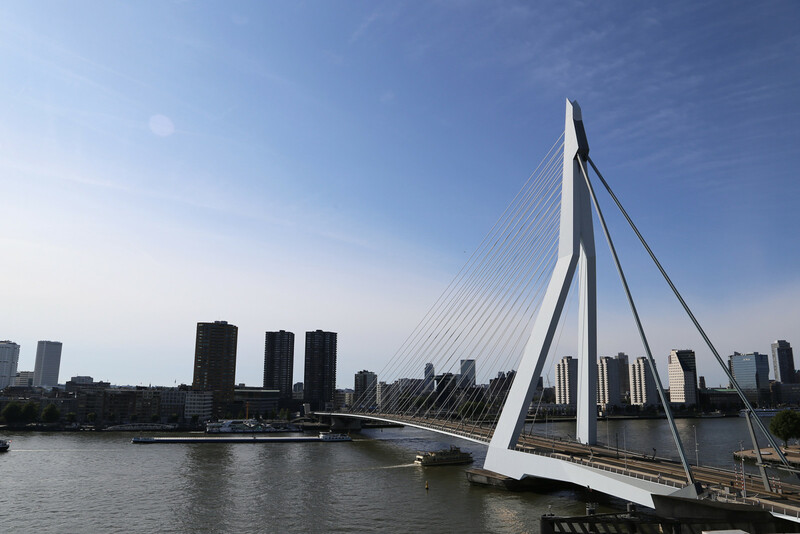 We were thrilled to explore Rotterdam as it’s fast becoming a definitive European destination. The city is truly bursting with energy spread across its individual architecture, food scene and concept boutiques. Want to explore more cities from a personal perspective? Head over to the full series of FvF Explores. Also, be sure to reacquaint yourselves with photographer Hans Wilschut, the first creative we spoke to in Rotterdam.